All of us at Safariline wish you health, prosperity and happy travels in this New Year of 2017. As this new year dawns, across the continent the sounds of Africa awaken from the call of the fish eagle, to the whistle of the helicopter as it hovers over the magnificence of the Victoria falls' mists that thunder. The whish of the hot air balloon makes its way across the vast Serengeti and over the Okavango Delta. The many senses of Africa abound: the grunt of the gorilla; the smells of the giraffe and wild sage, the alarm sound of the goway bird or the cat like meow of the trumpeter hornbill, the taste of breakfast cooked over the morning camp-fire. Make 2017 your year to do a safari by wing - traveling from camp to camp, area to area, terrain to terrain, wildlife to wildlife. Or by land with a private guide and driver experiencing the wonder of the landscape and game. Experience the slap of the water against the canoe on the Zambezi or the gentle glide of the mokoro thru the reed beds of the Delta. Safari by Wing or Over Land? Experiencing the colorful scenery and unique wildlife of the African continent is one of the most rewarding aspects of a trip there. There are many options for travelling across the terrain. Choose between the panoramic views of a wing safari or the up close and personal feel of one on land. Whether it be in an off road vehicle or a helicopter flying alongside the clouds, your African safari will surely be a memory that will last a lifetime. With flights between camps, these are designed for those who do not have as much time at their disposal. Winged safaris, use light aircraft to land you directly on private airstrips where deluxe accommodations await. While it is generally more expensive, it is the most efficient means of transferring you between safari camps easily, with plenty of time to enjoy activities when you get there. Consideration should be made by those who have difficulties with small aircraft and plan their trips accordingly. An overland Safari is led by professional guides as you travel by specially modified four wheel drive safari vehicles. The land safaris travel comfortable distances, allowing ample time to savor the places of interest and photograph the wildlife enroute giving you are more realistic idea of the day to day life of the local people. Ample time is required for an overland Safari and may have age restrictions. With so many countries throughout the African bush, it can be easy for some of the most breathtaking sights to be forgotten. 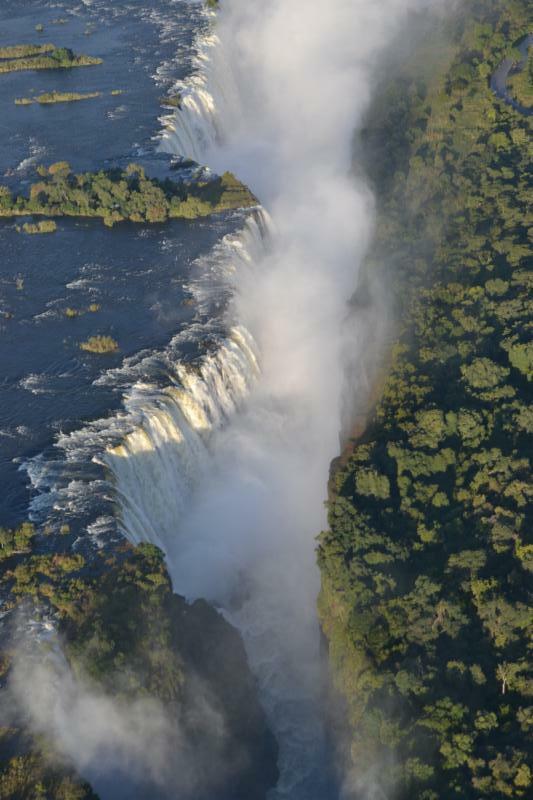 With the exception of the marvelous Victoria Falls, the country of Zimbabwe is one of those hidden gems. Over the last few years tourism in Zimbabwe has experienced slight declines, but the recent stabilization of the U.S. currency within the country has helped bring tourists from throughout the globe back to this beautiful country. 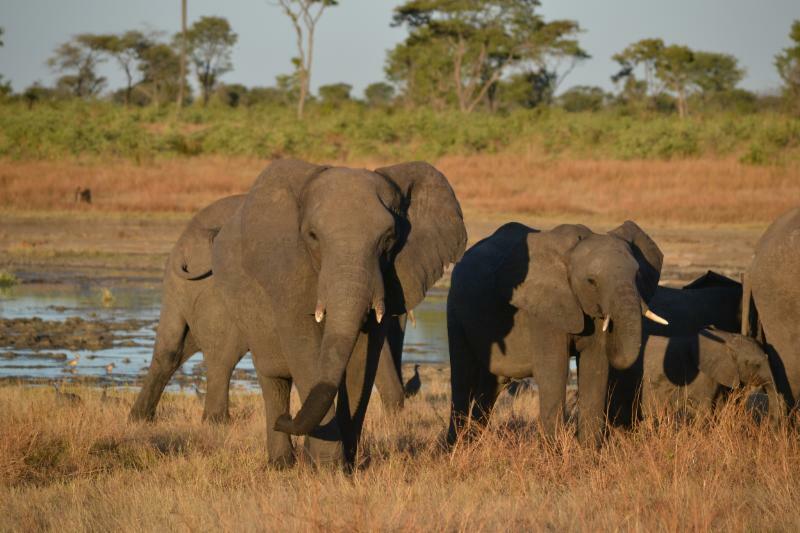 Zimbabwe is home to some of Africa's most fascinating wildlife including the "Big Five." (ie: elephant, buffalo, lion, leopard, and rhinoceros) Lions can be seen lazing in the sun while a herd of elephants play in the water hole. Buffalo can be found grazing across the savannahs on the 5 million hectares of land preserved for the wildlife. 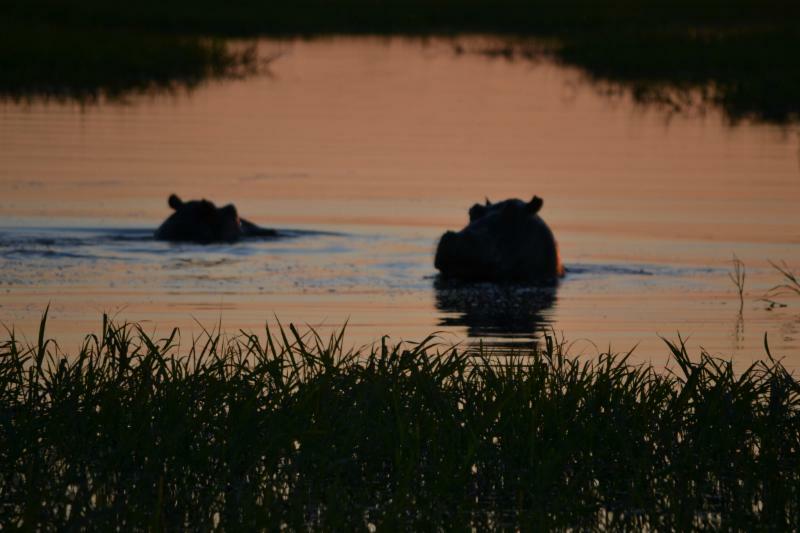 Zimbabwean safaris are guaranteed to be an experience of a lifetime. Guides are trained to be among the best of Africa, complettin extensive four year training with expertise in African nature, first aid and firearm usage. National parks can be found scattered throughout Zimbabwe's vast landscapes. Experience the roar of the massive Victoria Falls within the Victoria Falls National Park, or the clash of the waves at Lake Kariba, formed by Africa's largest man-made dam. Gonarezhou National Park, meaning "refuge of the elephants" and Hwange National Park allow for unique experiences with wildlife of many types. For Rhino tracking, don't miss the The Motopos Hills National Park to track Rhino on foot and stay in one of the most unique lodging in Africa at Camp Amalinda. Also located here near Bulawayo is the hill on which Cecil Rhodes is buried called Malindidzimu, the legendary place of benevolent spirits. Explore Zimbabwe's history by visiting the ruins of an abandoned city near Rhodesia, better known as The Great Zimbabwe. The mysterious city in ruins lies home to miraculous stone structures, walls, and labyrinths. It is believed to be thousands of years old and built by someone other than the African's, as their chosen architecture was mud houses. A safari experience like none other, float below the clouds, across Africa's magnificent landscapes in a hot air balloon. 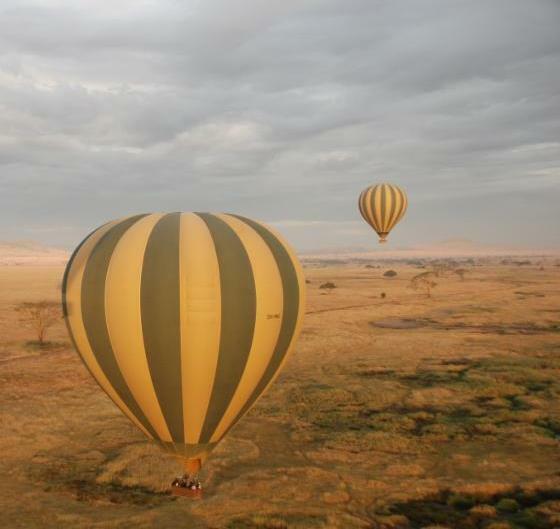 Balloon safaris are typically early in the day, allowing travellers to view the wildlife at their finest hour. Expect to be suiting up to go as early at 5:45 to 6 a.m. It is recommended to wear comfortable shoes, a hat and light jacket to be removed, with a t-shirt underneath. Be sure to bring a camera! The air allows the beauty of large landscapes to be viewed all at once, so bring a wide-angle lens if you can. As you stride across the hot sand the trains whistle in the wind, the smell of a native meal fills your soul with the most delicious aroma, you can almost taste it. But, beyond all the human noise, the thundering of Victoria Falls can be heard across the horizon. As you hear the echo of an elephant's call in the savannah, overhead a bird sings its song. Africa has its way of touching every sense of the human body and as the off season approaches it becomes a bird lovers paradise. Birding is a popular activity among tourists adventuring upon their African safari. African Bush Camps is offering a "secret season special" from December 1, 2016 to March 31, 2017. As the rains come in the African scenery lights up with magnificent thunderstorms (clearing into blue skies), bringing mothers and their young out from within the bush and allowing you to snap photographs of a lifetime. Seize this opportunity now by checking out the special here! Add the tuition of Wild Studio's 4 Night Package to your Selinda Camp safari to experience the photo shoot of a lifetime. The packages are currently on a tailor-made request basis for 2017 and will exclude the festive period. This package can also be combined with our free flights offer (October 1 to May 31, 2017). None of the countries in Southern or Eastern Africa currently have any restriction of travel related to Yellow Fever. However, each country in Africa has various requirements for anyone who may be travelling between countries, specifically those infected with Yellow Fever. We recommend visiting the CDC website to view a map of countries with yellow fever here. We're pleased to advise that an agreement has been reached between the governments of Zambia and Zimbabwe to reinstate the Kaza Univisa. The Uni-Visa allows tourists who qualify to travel freely between Zimbabwe and Zambia, within a 30 day period from the date of their first entry. It also allows for day trips to Botswana and return to back to either country without paying for any extra visa fees. Visa fee is $50 pp (cash), payable at port of entry and valid for 30 days. For further details visit the KAZA website. .
Every foreign tourist entering Rwanda is now required to purchase a voucher of an Emergency Medical Evacuation Services at USD 15.00 regardless of what type of existing insurance the tourist has. The voucher will enable the tourist to be evacuated by Akagera Aviation in case of an accident, or any medical related issue to King Faisal hospital in Kigali or any nearby hospital. Akagera Aviation will also provide first aid to the patient and make sure they are attended to at the hospital . Note that the USD 15 is up to 31dec 2017, next year will be USD 20.00. The EMES voucher has to be purchased 48 hours before arrival of the tourists and valid for only 14 days . This applies to all tourists even those only doing city tours only. When a crocodile loses a tooth, it very quickly replaces itself. 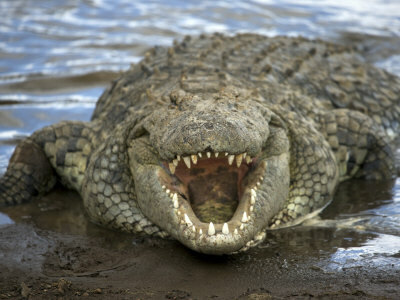 Crocodiles can go through up to 8,000 teeth in a lifetime. 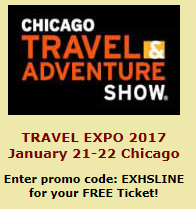 On January 21st and 22nd, we will be exhibiting at the 2017 Chicago Travel & Adventure Show at the Donald E. Stephens Convention Center, Rosemont IL. Since you are considered one of our VIP Customers, we would like to pass along this exclusive code that allows you free entry. Simply follow this link to our website. Go to Purchase Tickets, then click on: Promotion code. We look forward to seeing you January 21st and 22nd at the Donald E. Stephens Convention Center! Watch for our New Website - COMING SOON!